Nslookup, meaning “name server lookup,” is a popular built-in command tool that comes with most versions of the Windows operating system. It’s a handy tool you can use to diagnose the DNS infrastructure of the requested domain name. By default, the Nslookup command translates word-based domain names to numerical IP addresses (and vice versa). Other more powerful variants of Nslookup can be used to get information concerning the mail exchange server, FQDN, DNS server responsiveness, DNS configuration, etc. You can effectively check the status of your DNS records and rectify any issues relating to a particular service. For example, if your domain isn’t able to receive emails well due to problems with your DNS server, you may use the Nslookup command to confirm the domain has a valid MX record and ascertain that that MX record is pointed to the correct email address. 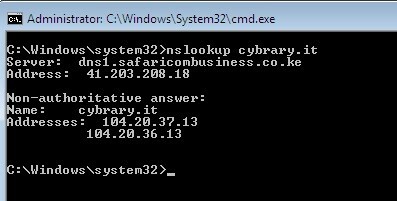 Nslookup can be operated in the command prompt on Windows to give the desired results. Here are examples using basic Nslookup commands for checking the health of DNS records. 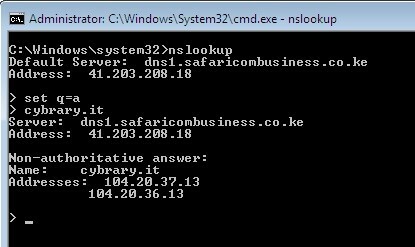 Typing Nslookup in your Windows command prompt will give details of your default DNS server and its associated IP address. Here, 41.203.208.18 is the default system domain name server used to query the external server. Thereafter, there are the lookup details for Cybrary.it. The name server query gave two entries, 104.20.36.13 and 104.20.37.13, indicating that Cybrary.it distributes its server load on different servers. Notice that the query produced a “Non-authoritative answer.” This indicates that the results come from a server that isn’t the root source for those records. To get an authoritative answer, the primary name server needs to be specified beforehand. There are a number of commonly used Nslookup commands, which are used for achieving various objectives. A full list of the most commonly used commands is provided at the end of this article. Notice the answer is the same as that of the earlier query we performed. This query gives the entire domain records of Cybrary.it, such as mail exchange records, primary server name, refresh time, etc. You can also check other types of DNS records using the same methods illustrated above. Any questions or comments? Please use the comment section below.